This past spring I purchased two lantanas that have been shaped into "trees" - stalk is woody and top is ball shaped. I live in zone 5, where they are annuals. I've brought them indoors hoping to winter them over inside, since the were pretty pricey. Will they make it in a south window and, if so, how do I care for them so as to put them back out next spring? They are dropping leaves and flowers like crazy and I also have dogs that I want to keep safe, but this room is one of their favorites also. Is it worth the trouble and mess? Thank you. 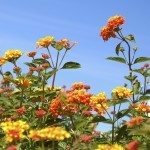 Lantana is toxic, but it also has a disagreeable smell to many animals, so they might not be interested in nibbling. Keep an eye on them to make sure they're not ingesting the leaves or flowers. Of course, if you let the plant go dormant and keep it in a cool place, there's no problem. Can't guarantee that you'll get it back in the spring, but it might be worth a try.